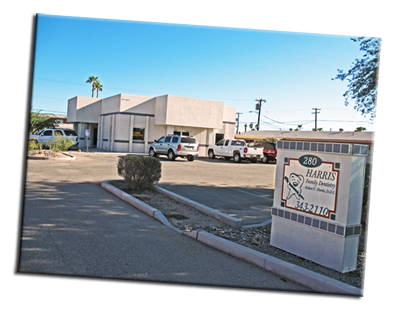 Welcome to Harris Family Dentistry in Yuma, AZ. We offer a well experienced dental team that will provide you with friendly, honest, up-to-date, comfortable dental care for you and the entire family. We acknowledge that fear, cost, and even shame can keep you away. TVs, Nitrous Oxide, friendly staff, clear explanations, insurance billing, and pre-treatment quotes are all steps we take to conquer these concerns. We are concerned about you, our patient, and want to make each and every visit a pleasant experience. We look forward to a long, healthy dentist-patient relationship. Call Harris Family Dentistry today to schedule your next appointment.